The gangland criminal was arrested last month as he tried to board a flight at Belfast International Airport. DUBLIN MAN JOHN Gilligan, who was arrested last month while allegedly attempting to flee Northern Ireland with cash in his luggage, was remanded back into custody for another week today after a District Judge excused himself from the case. Gilligan appeared before Antrim Magistrate’s Court via a video link from Maghaberry prison where he is being held since his arrest on August 23 last at Belfast International Airport by officers from the National Crime Agency. The 66-year-old, with an address in Greenforth Crescent, Dublin is charged with attempting to remove over €22,000 by way of criminal property from Northern Ireland, contary to both the Criminal Attempts and Conspiracy Order, and the Proceeds of Crime Act. 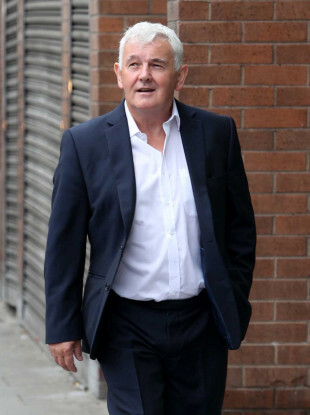 Today District Judge Nigel Broderick told parties in the case he could not deal with the case as in the past, as a partner in a firm of solicitors he had helped represent the 66-year-old when he appeared before the Central Criminal Court in Dublin. Broderick said he wanted to refer the matter back to Coleraine, but that the District Judge in the North Antrim Court was currently on leave, and he would need to “canvas” his views and he was therefore “minded to adjourn the matter for a week”. Earlier the prosecution had sought a four-week adjournment, telling the court that “a mobile phone to be examined and international lines of inquiry to be pursued”. However, Jim McGinnis, of Ian McFarland solicitors, objecting to the lengthy adjournment, said he had received “firm instructions to seek the shortest possible remand” in this matter. “Mr Gilligan is 66 and he does not enjoy good health,” added McGinnis, who also revealed that since being taken into custody, “he has already been taken to hospital”. The solicitor also told the court of a 2014 attempt on Gilligan’s life in which he was shot six times and that he would “urge the shortest possible adjournment in order the momentum in the case is maintained”. It was then that Broderick informed the parties that “I cannot deal with this case”, and outlined his reasons. Last month when initially before the Coleraine court, it heard that Gilligan claimed he was ‘under a sentence of death and had been ordered out of Ireland’, and that the seized Euros had come from his family and the sale of property. Gilligan had readily volunteered he was carrying the cash when questioned by members of the UK Border Force at the International Airport. In all €22,280, in two bundles, was uncovered from his luggage taken from a Spanish-bound jet. The District Court was also told that in the past Gilligan had served 17 years of a 28-year sentence. However, his solicitor said the Dubliner had not “been in any bother” or come to the attention of An Garda Síochána since his release from prison. Email “John Gilligan remanded back into custody over alleged money laundering offences”. Feedback on “John Gilligan remanded back into custody over alleged money laundering offences”.